Posted 1/17/12 by the Law Offices of John T. Orcutt, P.C. As used herein, “Site” refers to www.billsbills.com and other sites on the World Wide Web (including sites designed to be accessed by browsers using Wireless Application Protocol) originating in the United States which are owned and/or operated by the Law Offices of John T. Orcutt, P.C. (“LOJTO”). LOJTO reserves the right to modify the Policy in any way, at any time. Any and all such modifications will take effect immediately after LOJTO provides reasonable notice. Notice may be given by posting on the Site, via electronic communication, in writing, and/or any other means that provides reasonable notice. Your further use of the Site after such reasonable notice has been provided constitutes your acceptance of the modified Policy. LOJTO is a Law Firm that provides legal advice and services to people in need of bankruptcy and related legal advice and services. Solely for this purpose, and this purpose alone, LOJTO, directly and through third parties, collects personally-identifying and non-personally-identifying information when you fill out the Initial Questionnaire, Quick Contact forms and Contact forms accessible from within the Site. This information may include your name, address (street address, city, state, and zip code), contact information (e.g., e-mail address and telephone numbers), and other identifiers that provide LOJTO with information necessary to contact you directly, advise you on your legal rights, and, where appropriate, to help you exercise and protect your legal rights. LOJTO does not use the information for any other purpose. LOJTO will not, at any time, without your permission and consent, make any of your information available to any other person or entity. LOJTO may also disclose personally-identifying information as required by law, subject to your right, if any, to claim protection under the attorney-client privilege, or to protect the integrity of the Site if LOJTO believes that a guest has committed unlawful or otherwise harmful acts. If guests elect to use the Site’s "E-mail to a Friend" referral service for informing a friend about this Site, LOJTO does not, in any way, make use of the friend's name, e-mail address or the content of said e-mail. 3. Compliance with applicable laws, regulations, and/or legal or regulatory process. An IP address is a number that is automatically assigned to your computer by your Internet service provider whenever you log on to the Web. When you request pages from the Site, web servers may and sometimes will automatically identify and log your computer’s IP address. LOJTO may collects guests’ IP addresses, but only for the purpose of the purpose of system administration and to gather and report aggregate information to LOJTO to identify from where, geographically, and how many guests are accessing the Site. LOJTO does not combine IP addresses with other personally-identifying information or compile any session activity reports by IP address. A cookie allows LOJTO to store the personal preferences that you set during each visit to the Site, which in turn speeds up your future activities at the Site. During future visits to the Site, LOJTO will only read and retrieve information set in a cookie during an earlier visit to the Site. LOJTO does not currently use third party advertising companies and advertising networks to serve ads to you on its behalf when you visit the Site. LOJTO does use third party advertising companies and advertising networks to attract guests to visit the Site. Minors (individuals under 18 years of age) should always ask parents for permission before providing any personal information online. No information should be submitted to or posted on the Site by any Minor without the consent of a parent or guardian. Unless otherwise disclosed during collection, LOJTO does not knowingly provide any personally-identifying information about Minors, regardless of its source, to third parties, nor is this information knowingly used by LOJTO for any marketing or promotional purposes. Whenever you disclose information online in chat rooms, message boards, or similar posting areas, that information can be viewed, collected, and used by anyone. Therefore, do not disclose any information in such areas that you do not want made available to the general public. LOJTO is not responsible for the consequences of such disclosures including, but not limited to, unsolicited communications. LOJTO does not currently offer any subscriptions on or through the Site. You can access and modify certain personal information stored on the LOJTO website such as your name, phone number, email address, and mailing address, by contacting us via email at fpatterson@johnorcutt.com or via mail at the address below. The security of your personal information is very important to us, and we are committed to protecting the information we collect. While we cannot guarantee absolute security of your personal information, the LOJTO uses firewalls and Security System Protocols for all personal data we collect from our clients and potential clients. We also employ many different security techniques to protect personal data against loss, misuse, alteration, and unauthorized access. The Site has implemented appropriate safeguards to help prevent unauthorized access, maintain data security, and to make proper use of the information that LOJTO collects. Nevertheless, no transmission of data over the Internet can ever be completely secure. Thus, while LOJTO strives to protect your personal information, it cannot absolutely guarantee the security of any information that you provide. Please note that whenever you submit any information to us in connection with any services related to the LOJTO website, you consent to let us process this information in the United States as necessary to provide the services in which you are participating. 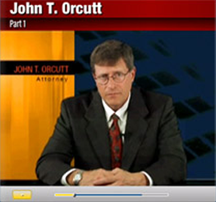 BillsBills.com uses a remarketing tracking cookie once a potential client clicks a Law Offices of John T. Orcutt Google Adwords ad. This tracking cookie will trigger our law firm ads to appear on additional web pages that allow for google ads. Google uses our remarketing ad in an attempt to remind past viewers of our website of our debt relief services. By using Google's remarketing code, we also use Google information on 3rd-party audience data (such as age, gender, and interests) with Google Anlaytics.